One of the important signal integrity measurement solutions is the digitizing oscilloscope. Digitizing oscilloscopes have different forms — the sampling oscilloscope, the digital phosphor oscilloscope (DPO) and the digital storage oscilloscope (DSO). Ideally suited for low-repetition signals with narrow pulse widths or fast edges, the DSO can easily capture transients and one-time events, and is the best solution for multi-channel, high-speed design applications. The DPO, on the other hand, is the perfect tool for digital troubleshooting, for identifying intermittent signals and for various kinds of mask testing and eye diagram. The extraordinary waveform capture rate of the DPO overlays sweep after sweep of data more easily and quickly than other oscilloscope, offering frequency-of-occurrence details, in intensity and colour, with unrivalled clarity. The digital sampling oscilloscope is the tool of choice when the real-time oscilloscope’s bandwidth is not enough. It is ideal for capturing repetitive signals with much higher frequency components than the sample rate of the oscilloscope. 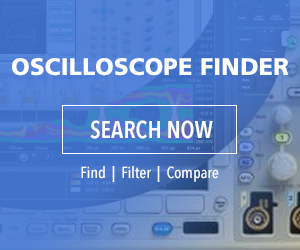 Measuring signals faster than other oscilloscopes, the digital sampling oscilloscope can also achieve up to 100 GHz bandwidth using sequential equivalent-time sampling of repetitive signals. In selecting an oscilloscope, users should take note of several performance considerations that affect the quality of signal integrity measurements. These include rise time, bandwidth, record length, waveform capture rate, triggering flexibility and sample rate. Rise time measurements are important in the digital world. Rise time is the more appropriate consideration when selecting an oscilloscope to measure digital signals such as steps and pulses. Generally, an oscilloscope with rapid rise time can more accurately capture the fast transition’s critical details. The rise time taken by oscilloscope depends on both the rise time of the oscilloscope and the actual rise time. Faster oscilloscope rise time results to more accurate rise time measurements. Meanwhile, oscilloscope bandwidth is critical when troubleshooting designs with fast rise time signals or high data rates. The digital signal’s rise time carries higher frequency components than what is implied by its repetition rate. To capture the higher frequency components, the oscilloscope should have adequate bandwidth while showing signal transitions accurately. The oscilloscope cannot resolve high-frequency changes without sufficient bandwidth, while its special features and strengths will mean nothing. Record length refers to the number of samples that an oscilloscope can store and digitise in one acquisition. With the oscilloscope storing only a limited number of samples, the length of time captured or the waveform duration will be inversely proportional to the sample rate of the oscilloscope. Expressed as waveforms per second (wfms/s), the oscilloscope’s waveform capture rate determines how often the oscilloscope captures a signal, while the oscilloscope’s sample rate shows how frequently it samples the input signal in a cycle or waveform. Oscilloscopes nowadays provide triggers for various analog events, including slew rate conditions and edge levels; low-amplitude events and events width conditions; pulse characteristics; serial data patterns as well as setup and hold time violations. These trigger types assist engineers in isolating and detecting signal integrity problems. The digitizing oscilloscope also features various combinations of timing, logic triggers and voltage as well as specialty triggers, for applications like serial data compliance testing.